The calming effect of sensory bottles can do wonders for kiddos who become overstimulated or upset. And the best thing about this calm down tool is that you can use items in the home to make your own! Start with a clean plastic bottle (thick, wide mouth Gatorade and Voss bottles work great). 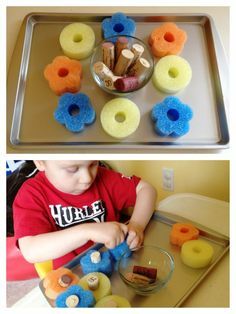 Place magnetic letters, foam shapes, blocks, ribbon, yarn, rubber bands, marbles, sequins, buttons, glitter and/or beads into the bottle. Fill the bottle with rice, flour, water, dish soap, corn syrup, baby oil, sand, shampoo, conditioner and/or hair gel. Secure the lid tightly to prevent a mess or choking hazard (you can seal it tight with a hot glue gun). And VOILA! Before you get started, check out these 2 resources to explore different mixture ideas and discover ways to target important skills while using sensory bottles. Turn-Taking Is Not An Important Skill...Said No Teacher Ever! Start using the words “My Turn” and “Your Turn” during everyday activities. Play simple cause and effect games or board games to promote turn-taking. Use a timer to help visually prompt children when their turn is over or to help them understand how long they have to wait until it is their turn again. Use a metal brad and cut out an arrow to make a spinner. Attach them to a piece of paper and tape or Velcro a photo of the individuals who will take turns. Have your child move the arrow to show whose turn it is. Write “It’s my turn” on a piece of paper or “My Turn” on a wooden block. The person whose turn it is holds the card or block while they take their turn. When that person’s turn is over, they hand it to the next person. Write down on a piece of paper the names of each individual participating in an activity in the order that they will take turns. If your child needs extra support, allow them to clip a clothespin next to the person’s name who is taking his/her turn. Your child can keep moving it along as others take their turn. Add turn-taking into playtime. Take turns adding blocks to a tower or pushing a train around the tracks. Take turns playing a musical instrument or turning the pages in a book. Take time to teach your child how to wait. 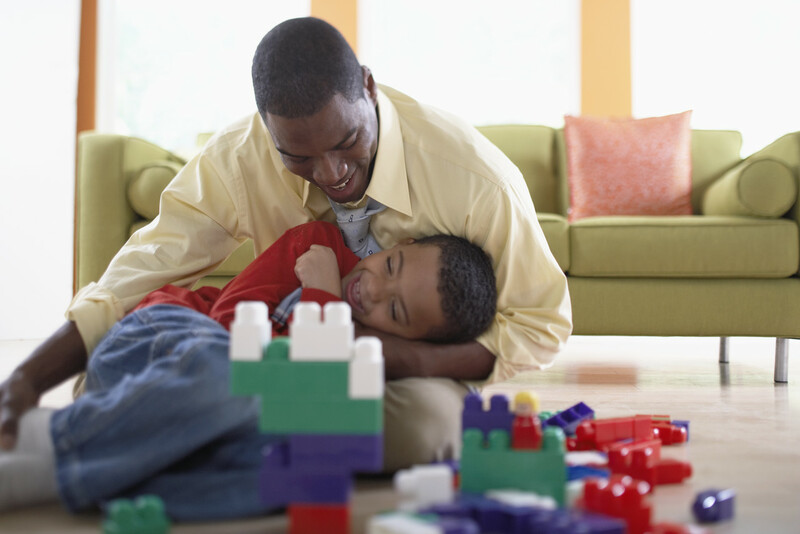 Then, acknowledge and congratulate your child when he/she waits for a turn. Write “Wait” on a small square piece of paper to serve as a picture card to visually support your child during his/her waiting time. Make a square on the floor to show your child where to put on his/her shoes. Put a “Don’t Cross” line of tape on the ground to help keep kids safe and from wandering. Make an "X" with the tape to indicate where to stand while waiting. Outline a box to show where to place hands while waiting, or where to return toys after your child is done playing with them. Place a line on your bathroom wall to show how far to pull down the toilet paper before ripping. Add a strip of tape down the table to outline personal space boundaries between your child and others. We'd love to hear from you! Call us at 312.880.9277 or email us at support@earlyvention.com to ask questions or share your thoughts about this post. The idea of alternative seating is gaining popularity among therapy clinics, classrooms and even business offices. 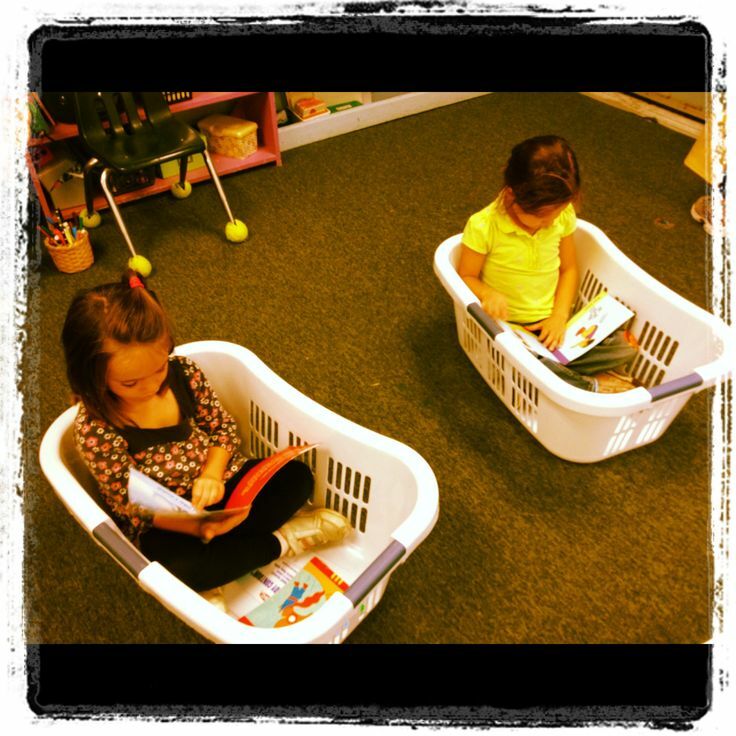 What is alternative seating? Simply put, it provides alternatives to the everyday chairs we use. It allows individuals to receive sensory input through gentle body movements, promotes proper posture, increases attending skills and helps with understanding personal boundaries. Carpet squares, cube chairs, bean bags, bean bag chairs, pillows, peanut balls, ball chairs, wobble chairs, sit 'n' gyms and movin' sit cushions are some alternative seating options to check out. 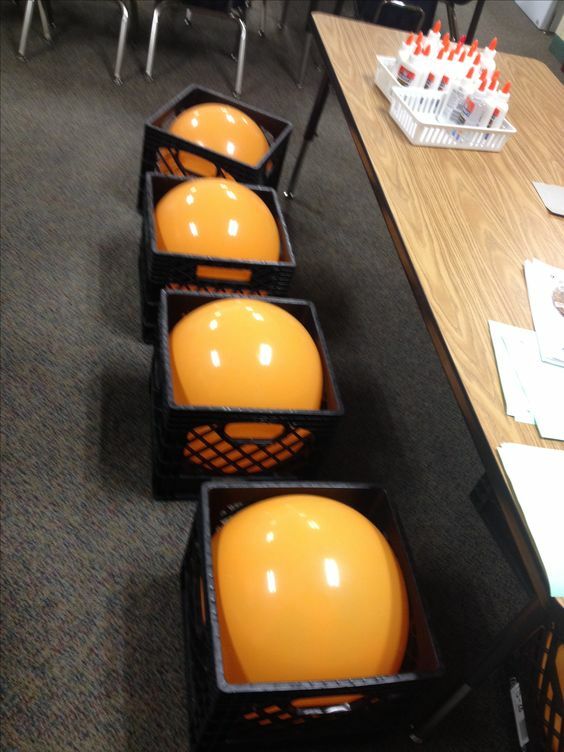 BUT, why spend the money when you can create your own alternative seating options?! Here are some of my favorite (and easy) sensory hacks to try. 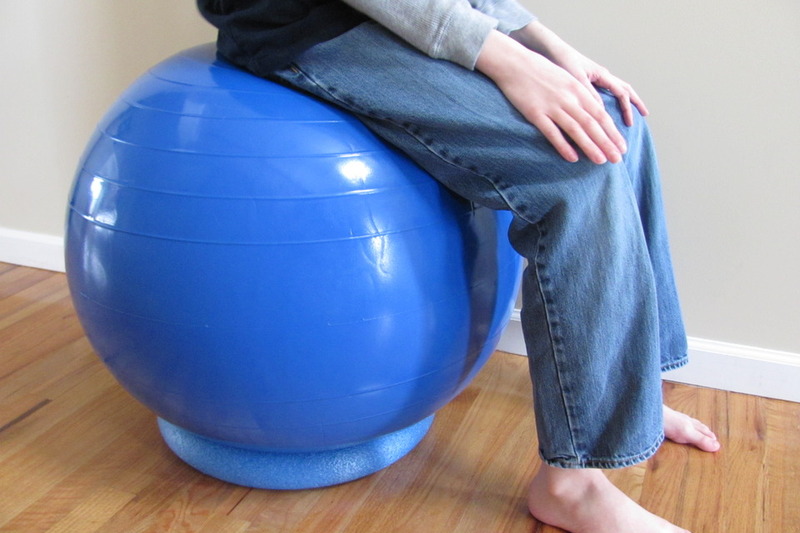 Hack #1: Use a plastic milk crate and a child-size yoga ball. Don’t have a milk crate? Try a cardboard box. It won’t last as long, but will temporarily prevent the ball from rolling away. Need something for a larger ball? 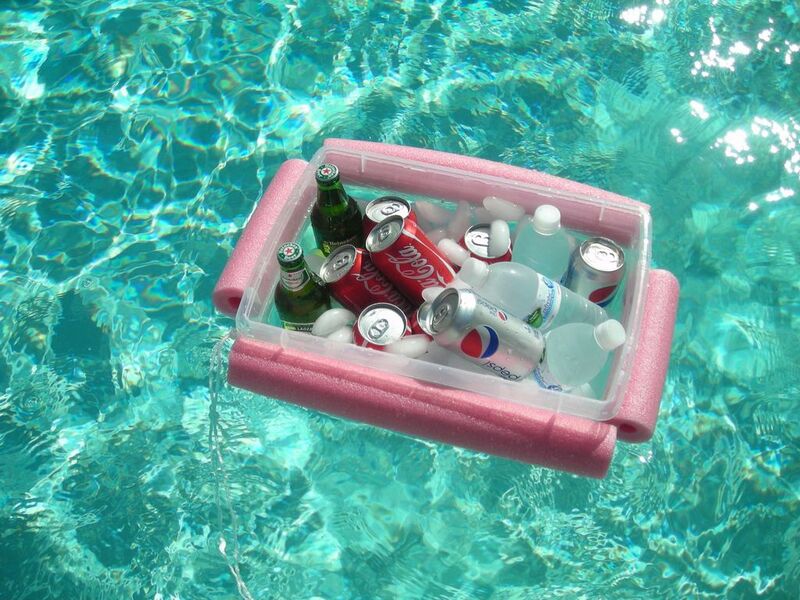 Try a plastic party tub. Or, create your own ball base by using a pool noodle from the dollar store. Some children like to sit in tight spaces. Provide that secure feeling for your child with these next two thrifty sensory hacks. Hack #2: Do you have an extra storage bin laying around your house? Cut ⅔ of the lid out. Apply duct tape around the part that was cut to assure there are no sharp edges. Then throw a small blanket or pillow inside. Hack #3: You’ll need a rectangular-shaped laundry basket, along with towels, blankets or pillows. Line the laundry basket with the soft materials you’ve collected while leaving space in the middle for your child to sit. Bonus: It’s quick and easy to recreate this seating option at others’ houses, if needed. Hack #4: Use a paint bucket to make a stool with built-in storage. Check out this tutorial with step-by-step directions. 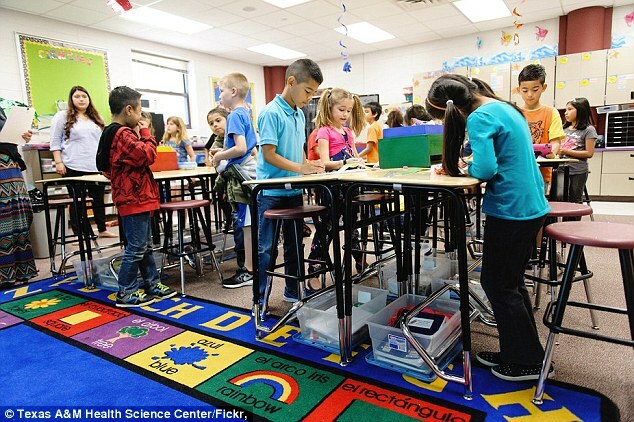 Children and students will likely take more ownership of their stools, and sitting on them, if they can decorate their own bucket. Hack #5: Let them stand! A very smart physical therapist once asked me if I sit or stand while cutting vegetables or putting on makeup (thanks for the insight, Norma Wall!). For some activities, our bodies are able to focus better and complete tasks with more ease by standing instead of sitting. So ask yourself, could my child or student better focus on the task at hand while standing? If so, let them stand! Sensory Bottles...and Developmental Skills They Can Target! 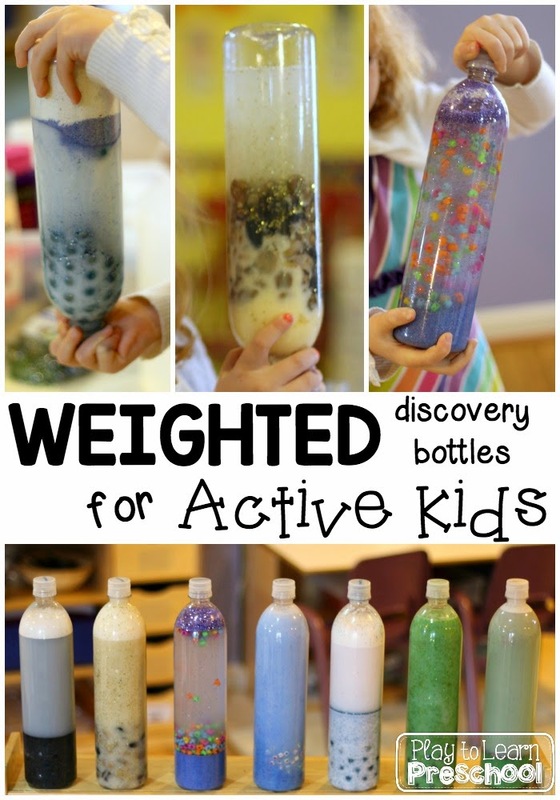 Lots of children think sensory bottles (aka discovery bottles) are cool. We think the coolest thing about them is that you can make them yourself! There’s a ton of information on different ingredients you can include to create, for example, an I Spy bottle or a calming bottle. There’s far less information on what to actually do with these bottles after they’re made, aside from shaking and flipping them upside down. Here are some developmental skills to target while you and your child play with sensory bottles. Rhymes with the word you say. Science Skills: Talk about which items sink to the bottom of the bottle and which ones float to the top. Describe any sounds the materials inside the bottle make. Let your child hold a magnifying glass to examine different items up close. crawl, jump or animal walk (e.g. bear, duck or crab walk) after it. Add heavier items to the bottle, such as marbles, beans, corn, rocks or sand, to provide more weight. Allowing children with extra energy to carry around or hold a weighted bottle can help them both calm and organize their sensory system. 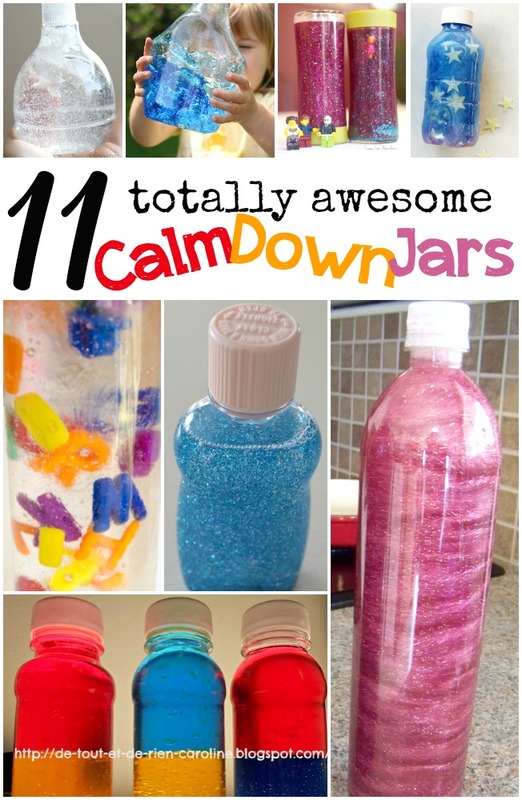 Behavior Development: Use the sensory bottle as a calm down jar. When your child is upset, have him/her shake the bottle and encourage him/her to take deep breaths while watching the contents swirl, slow down and eventually settle back to the bottom. Want to learn more? Sign up for our newsletter to learn how to make a sensory bottle and discover a variety of ingredients and themes to keep it interesting.